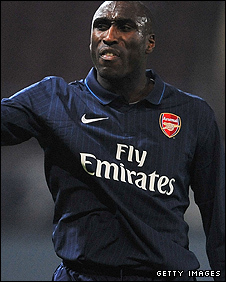 Sol Campbell has completed his surprise return to Arsenal, signing a contract until the end of the season. The 35-year-old former England defender has been a free agent since being released from his contract with League Two side Notts County in December. And after a trial period and practice match, Gunners boss Arsene Wenger has signed Campbell as defensive cover. "He brings experience, good advice, and physically he has worked hard. We're giving him a chance," said Wenger. "For us it is a good help until the end of the season, and for him it is a good opportunity to show he can still play in the Premier League." Campbell will not be fit enough to feature in this weekend's match against Bolton, however, while Wenger has admitted the defender needs time to build up his match fitness. The veteran played 45 minutes of a reserve match against West Ham on Tuesday. Following the game, the club said he played in the 4-2 win "with a view to a permanent move back to Arsenal Football Club". "I need to get minutes under my belt, a couple of reserve games at least, before I can start looking any further ahead," said Campbell earlier in the week. "I'm ecstatic to be back and I have worked hard to get there. Arsene Wenger is not stupid. He wouldn't have taken me back if he didn't like what he has seen." Campbell played only one game for Notts County after leaving Portsmouth. The former Tottenham defender joined the Magpies in August, with the involvement of former England manager Sven-Goran Eriksson a key factor in persuading him to drop down to League Two. However, he left less than a month into a five-year deal and was strongly linked with a move to Championship leaders Newcastle. He eased himself back into competitive football by playing for only the first half of the reserve match before being replaced by Ignasi Miquel, with there being no suggestion Campbell was injured. Campbell, who was capped 73 times by England and played at two World Cups, was keen to resume his career as quickly as possible after settling his contract dispute with the Magpies. It is understood offers were also on the table from Hull and Newcastle but Arsenal were always Campbell's first choice and he is still held in high regard by Wenger. "He has a fantastic attitude and good fitness," said Wenger last week. "He is important in the dressing room as well. He's positive with the young players." Campbell spent five years at Arsenal between 2001-2006, during which time he won two Premier League titles, three FA Cups and scored in the 2006 Champions League final defeat by Barcelona. Wenger's decision to bring back the veteran defender, who will provide cover for Thomas Vermaelen and William Gallas along with 32-year-old Mikael Silvestre, will cast further doubt over the future of Philippe Senderos, who told BBC Sport he is keen to leave the club in pursuit of first team football. Earlier this week, Arsenal great Bob Wilson said Campbell's return to the club would be a welcome one. "In a nutshell he is a great professional and has got massive experience," former goalkeeper Wilson told BBC Sport. "He is very much a winner, single-minded and he certainly loves Arsenal and the way they go about doing things." Wilson also allayed fears that the centre-back is too slow to compete again at the highest level. "The first yard is in your brain and it's not a long term signing for Arsenal," he added. "He's been training with Arsenal since leaving Notts County, is very fit, the guys love having him around and I think the bottom line is Arsene likes having him around."